Most of us are going bananas this month! Why? Because this month's Little Thumbs Up Event is Banana! And you may have seen many Kuih Kodok (Mashed Banana Fritters) going round the blogs. I was planning to make these banana fritters months ago for LTU, well, here it is. Most of us have memories of eating these fritters during our growing up years. As for me, my mother used to make these fritters all the time. We have banana trees growing by the side of our house, and when the fruits are ready to be harvested, there are a lot of bananas! A whole stem of bananas have many, many tiers, and each tier has many bananas! More than we can eat! So my mother would share some of the bananas with our neighbours and used some to make these delicious all time favourite! Though in our house, we call these banana fritters as Goreng Kodok. These banana fritters are really common in Malaysia and can be found in most stalls that sells fried banana and other snacks. I however, do not really like the ones that these stalls are selling, as the fritters would be rather compact on the inside and sometimes dry, and of course, there are always not enough of bananas in the batter! I supposed the best ones are still homemade, and my favourite are the ones that my mother used to make, puffy and light, lightly crisp on the outside, and soft, chewy, moist with chunks of bananas on the inside. You would not stop at just one! Firstly, sift some plain flour with baking powder and salt into a large bowl. Add some water and sugar and stir well. The consistency of the batter should be moderately thick, a large spoonful of the batter should be able to drop in dollops easily. Next, mash the ripe bananas, leaving them a little chunky. Add the bananas to the batter till evenly combined, and keep aside for 15-20 minutes. Heat some oil for frying over moderate heat. Drop heaped tablespoons of the batter into the hot oil, the batter will puff. Fry both sides, turning them now and then to brown them evenly, this would take about 3-4 minutes to cook, When the fritters have turned golden brown all over, remove them with a slotted spoon and drain them on paper towels. Serve these Goreng Kodok while still warm with a cup of tea, sit back, take a break and start snacking!! Love these puffy Goreng Kodok! When eaten while still warm, the outside is lightly crisp, and the insides are moist, soft, chewy with delightful bites of the banana chunks. You would not stop at just one! Sift plain flour, baking powder and salt into a large mixing bowl. Add sugar and water, stir well to combine. Batter should be moderately thick, dollops of batter should be able to drop off from the spoon in dollops. If batter is too thick, add an additional tablespoon of water at at time. Mash the bananas, leaving some of it chunky. Add the bananas to the batter and mix till evenly combine. Keep aside for 15-20 minutes. Heat some oil over moderate heat. Drop heaped tablespoons of batter into hot oil. (Tip: fry one fritter first to check on the saltiness and sweetness, add a little more salt or sugar to the batter if necessary, before frying the rest of the batter). Once batter has puffed and starting to change colour to light brown, turn fritter and fry both sides till golden brown, which takes about 3-4 minutes. Use a slotted spoon to remove fritters and drain on paper towels. Serve warm. 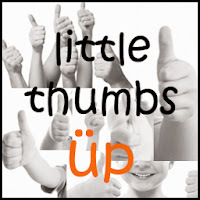 This post is linked to Little Thumbs Up (March 2015 - BANANA) event organised by Zoe of Bake For Happy Kids and Doreen of My Little Favourite D.I.Y and hosted by Faeez of Bitter Sweet Spicy. Hi Joyce...I luve the look of ur banana fritters, so crispy and 'pong'! Hello Joyce... This time can " 一箭双雕＂。Very good you can join BREE and TLU event and share your best recipes. The golden Bnn balls make me hungry now. Ha.. Ha.. I've seen several banana fritters this week but still can't get enough of it lol Your goreng kodok is a bit similar to our version back home except for the shape and the addition of sugar after frying . This look so good Joyce!! I need to make this too. They look so good. Fion, Doreen and I had recently started a FB group cooking and baking food according to the theme of Best Recipes and LTU... Fion has suggested a viral cooking wagon of cooking kuih kodok... and so everyone started making kuih kodok... ha ha ha.